In honor of our glorious friend, Ask Alexander, The Conjuring Arts Center has collaborated with M. Stutzman, artist for David Blaine's wonderful playing cards and posters, to bring you the Ask Alexander deck. Featuring numerous diabolical properties and an elegant, cunning design, this is a deck that you will be proud to have with you in magical endeavors, as well as an excellent addition to your card collection. 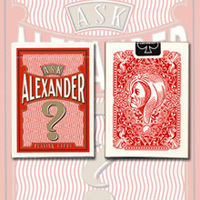 The Ask Alexander deck is printed on the finest casino paper and to the highest standards available at the United States Playing Card Company. 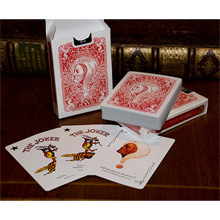 During the course of Conjuring Arts Center efforts to make various custom playing card decks, they have made numerous trips to the USPCC's facilities in order to personally oversee the manufacture of their playing cards and to make any and all adjustments necessary to craft the perfect deck of cards. 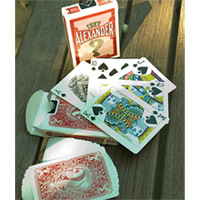 The cards are cut in the same fashion as their previous decks to facilitate smooth handling and effortless faro shuffles.You may notice a similarity to Bulldog Squeezers and Angel Back Squeezers. The bold one way back design of the Bulldog Squeezers combined with the elegance and nuance features of the Angel Back Squeezer deck make this a must have.